Every day is an empty jar....and we get to decide how we'll fill our jar. How is our daily choice. There are certain things in life that are big, that must be part of our days. Big Stuff that anchors and centers us. The Big Stuff: Time with Him. Mama-love with the children. Creative pursuits that are our act of worship to Him. We each get to decide what things are Big in our own personal lives, what we individually consider to be our Big Rocks. And then there is the little stuff. The Necessary stuff. The Gritty stuff of life. Dishes, laundry, meal-making. And we too get to decide what we personally consider to be the gritty, gravelly, sand stuff of life, the small, daily activities that lay down the base for the rest of our life. Time is finite. We only get so much of it. And we all get the same amount, everybody. Every day, each of us are handed our own jar---our finite, equal amount of time. How we fill that day up, how we use our time, what we decide to put in our jar---it is a choice. Every single day we get to decide. And every day we get a new jar to decide what to put in. 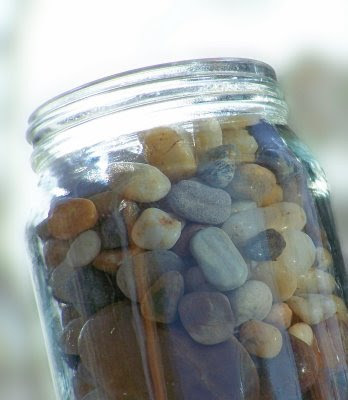 If I fill my jar first with the Gritty, Daily stuff, I’ll never be able to get the Big Rocks all to fit in my jar. However, if I fill the jar with the Big Rocks first, then I can pour the Gritty, Daily stuff in and it will sift in and around the Big Rocks. I am slowly getting it: If I don’t get the Big Rocks in First in my day, it becomes impossible to get them all into my jar. What does it matter how much I do in a day, if what I am doing isn’t the Big Stuff? It’s that simple..(and not). As the sun rises, so does the wind pick up. The wind is driven by the sun. And, quite simply, I will get more Big Rocks into the jar of my day if I get up before the sun rises---before the wind of the day picks up and begins blowing all the gritty sand of everyday living around. Getting up early doesn’t start in the morning. Getting up early starts at night---when you go to bed. Just like my Grandpa used to say, “Early to bed, early to rise, makes a man healthy, prosperous, and wise.” Rising early is a function of going to bed early. So, self, shut the lights out by 10 pm. Daily Reading of my Bible….as soon as my feet hit the floor. This is my biggest Rock. It is the non-negotiable BIGGEST ROCK. It must go into my jar first. Or my jar will crack and everything I try to put into the day will leak out anyways. ---before breakfast. If, for instance, I had a doctor’s appointment before breakfast, I simply would not get distracted, and I wouldn’t break the appointment. So make an early appointment with self for creative endeavors, and keep it. It is much harder to get that Big Rock into the jar of my day later. And then mark it down that blank calendar square everyday the appointment with self is kept. It is the visual testament that Big Stuff was tended to daily. It seems juvenile, but it isn’t. Just like the patriarchs piled up heaps of rocks to leave physical markers of their encounters with God, so placing visual markers on the squares of our days leaves a trail of how we used the time He has given us. —on a watch, PDA or timer on a neck rope. It is the way to make the most of the space in the jar. Otherwise, I let nicks and crannies sit as empty, unutilized space in the jar of my day. And those petered away 15 minutes segments add up to significant lost time. For some inexplicable reason, I am easily fooled into thinking most jobs are serious undertakings--so I avoid beginning. But 15 minutes is the way every job begins. Taking a summer course for university, I worked at studying 15 minutes at a time throughout the day---biting the job off into bite sizes. And 15 minutes at several intervals throughout the day added up to another university credit! Setting the timer for 5-10-15 minute segments is the tool by which I can ensure all the crannies of the jar fill with what He has called me to do. Lord, teach me to number my days….my moments….that I might present to You a heart of wisdom. Teach me how to deem what is the Big Stuff…and what is the Gritty, Necessary Stuff. Teach me how to get the Big Stuff in first. And teach me how to use every moment effectively, filtering all the small details down into all the spaces in the jars of my days. Lord, every day is an empty jar that You graciously and generously give me. How will I fill today? jennifer this is especially for me and you!! !